Mixing / Mastering – Affordable Pro Plugins. If you have been reading my blog you will know I am a fan of free and affordable plugins. I’ve tried Waves and other ‘leading brands’ and I can’t see the justification in price with some in the range of £500+! I stumbled across a company called Minimal System Instruments. It happened that the where giving away a few free plugins. Ultracompressor a vintage compressor was up for grabs so I downloaded it. I’ve now used it on 3 mixes and it’s performed really well overall. So they are super affordable and they happen to have a MASSIVE 50% off sale on right now until next month. Prices range from £19.99 for a mixing and mastering suite down to £4.99 for a compressor! What a steal they are! These are pro-level plugins and worth every penny. I’m about to pull the trigger on a few of these. I don’t often buy plugins but with the sale I can’t pass these up. Reviews coming soon…In the meantime grab a free plug and see for yourself. 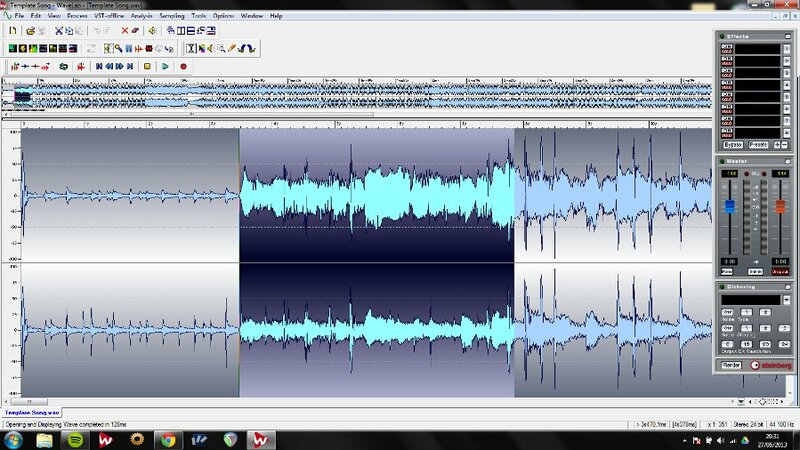 [EDIT] 26th July 2013: Downloaded the demo version of MSI’s Master Compressor, wow what a great compressor for the master bus. Tried it on several mix sessions and the way it glues the tracks together is excellent! Also there is an added body to the mix with a smooth and more powerful impact overall. Best of all it’s half price at £4.99!!!! Deal! Very happy with this find. Mastering – Polishing your mix, fixing small issues, making it sound louder and more powerful. One of the most mysterious elements of studio audio, or is it? Well I must admit some of it is. Some mastering engineers have amazing ears and can identify problem frequencies easily and even make poor mixes sound pretty good. I am an amatuer at this so my guide should be taken as a stepping stone, a beginners guide on mastering at a home studio level. OK so you have a stereo track that you have mixed down right? Good! You can load this track into your DAW and start a chain of plugins for mastering. Please remember to add one plugin at a time and adjust the settings slowly. Make it subtle. a lot of subtle changes added together make for a big change in the end. Click this Image (above) to see my mastering chain setup. BX Cleansweep – First in the chain all this is used for is a highpass filter at 50hz to remove any low end junk before sending to the next few plugins. Ferric TDS – Next is a nice tape dynamic simulator. This add’s a little bit of crunch (saturation) to the track. Subtle but noticeable. Start with a small amount of saturation and work from there. BaxterEQ – A smooth shelving EQ, this adds a little sheen and sparkle in the high end and used to tame some of the harshness of midrange frequencies. Experiment! BX Solo – Next I use the stereo widening of this plugin to spread the mix. Note I only use about 20% of this feature, too much can ruin your mix. Density MkII – A single band compressor with very light compression settings just to glue the mix together. This raises quieter parts of the song and controls the louder sections of the track. I think there is a preset for Mix glue try that as a starting point. 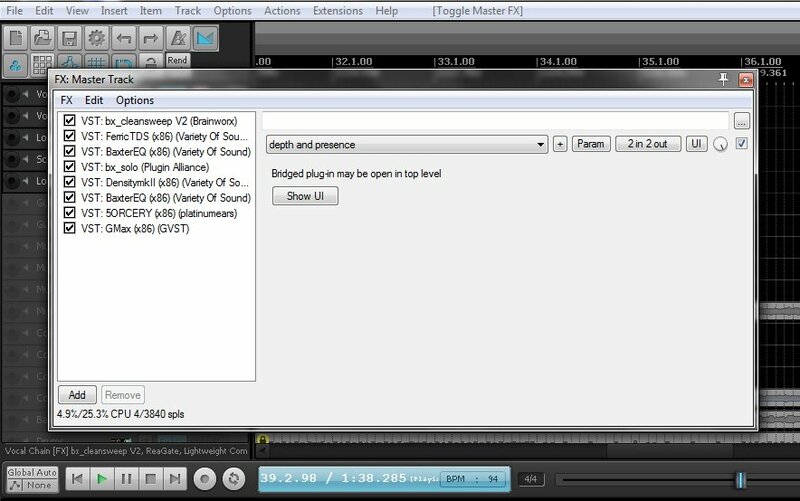 BaxterEQ – Another EQ again, this time I use this to add back in some shine to the track that we might have lost. 5ORCERY – Now a multi-band compressor. I use this to really focus on compression of 4 separate bands, Low, Low-Mid, Mid and Highs. This really glues everything together with a fuller overall sound. Solo each band and make small adjustments then bring in the remaining bands to listen. Repeat for each band. GMax Limiter – Finally a brickwall limiter. Ceiling is set at -0.3db and I usually start with about 8db on the output control and never exceed more that 12db maximum. Once all your plugins are active your track should be louder and the mix should sound more consistent. Just be aware of each plugins output levels, lower them if your mix becomes a little unruly to0 much output from each can add up to a bad master. If you want to download any of the above plugin’s they are free. Just google their names and download what you require.